During week 15, prices for day-ahead baseload delivery were primarily driven by levels in wind output. 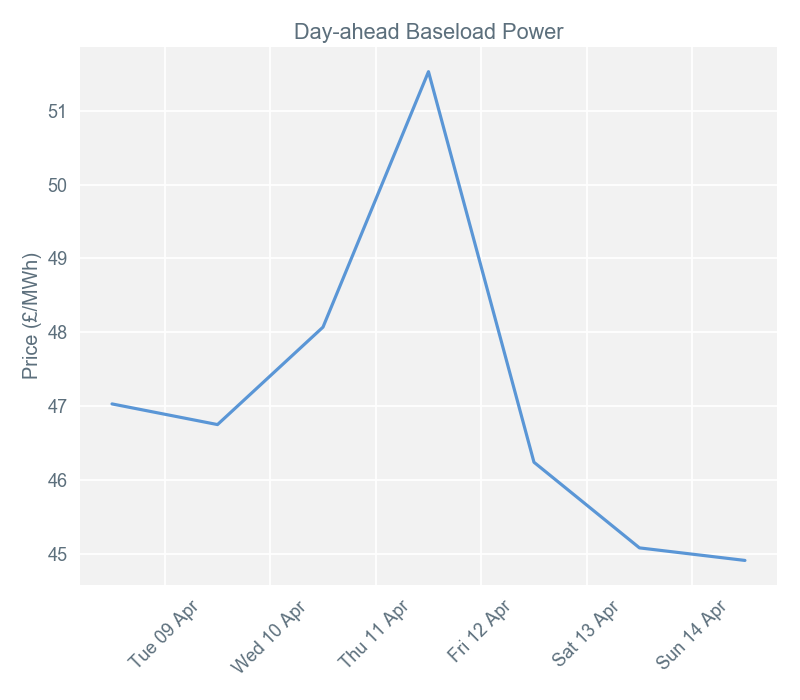 The week’s lowest price was for delivery on Sunday 14 April, when wind output was expected to be higher than on Saturday 13 April, and significantly higher than Friday 13 April. This expected increase in wind pushed some more costly forms of generation out of the stack. The week’s highest price, for delivery on Thursday 11 April, was driven by low expected wind output and an increase in the day-ahead gas price. 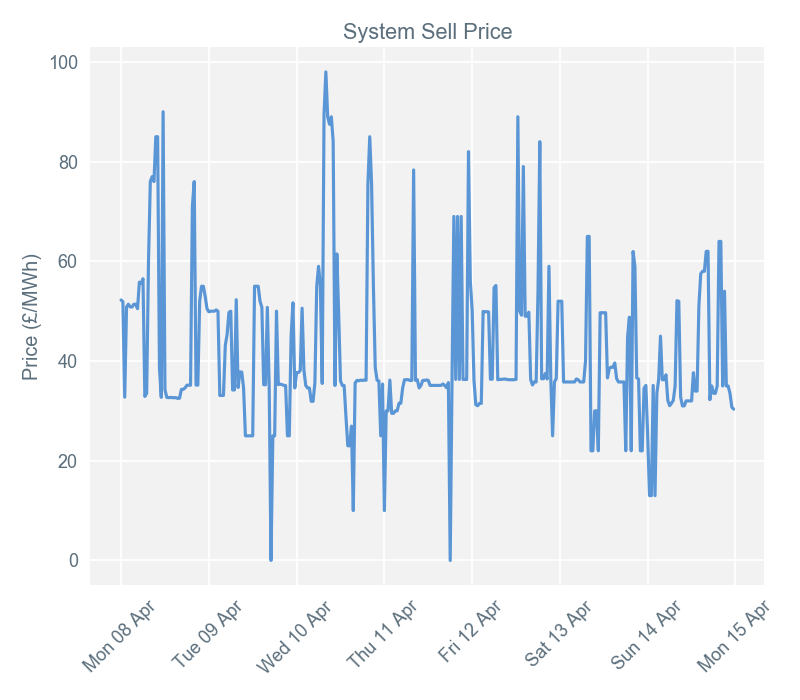 These factors lead to a price of £51.49/MWh, the highest since Thursday 11 April. Low wind output - compared to Wednesday 10 April - meant that an additional 300GW of coal-fired generation, and an extra 1GW of gas plant were required to meet the peak demand. Single imbalance prices during week 15 averaged £41.62/MWh, with a maximum of £98/MWh, and a low of £0.00/MWh. The week’s highest price was on Wednesday 10 April for actions taken by National Grid for settlement period 17 (08:00-08:30). 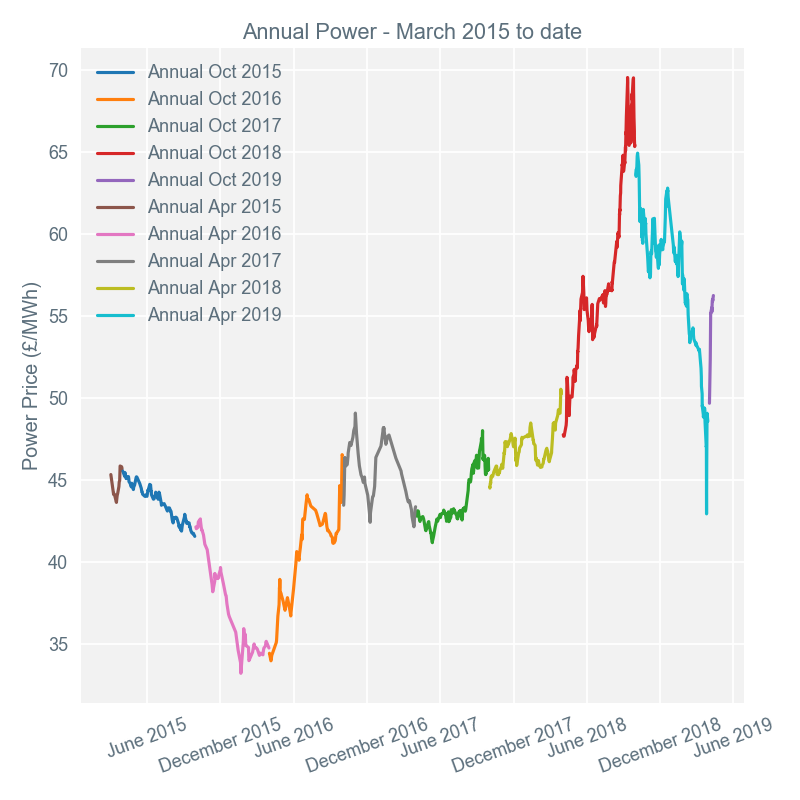 As demand ramped up towards the morning peak, the UK system was in imbalance, meaning demand would need to be reduced, or generation increased. An increased output of 500MW from pumped storage hydro, during this settlement, ultimately lead to the final price. National Grid accepted numerous offers from Dinorwig pumped storage to increase output. The week’s lowest price was on Tuesday 9 April for settlement period 35 (17:00-17:30); which, interestingly, coincided with peak demand on this day. The final price was set, again, by Dinorwig pumped storage hydro. The accepted bid of £0.00/MWh meant that Dinorwig was reducing generation output, or consuming electricity by pumping water at zero cost. At 9GW, the highest solar peak of output this year was seen at 13:00 on Thursday 11 April. Due to its location on rooftops of homes and businesses, solar generally acts as a demand suppressor, reducing pressure on the grid. 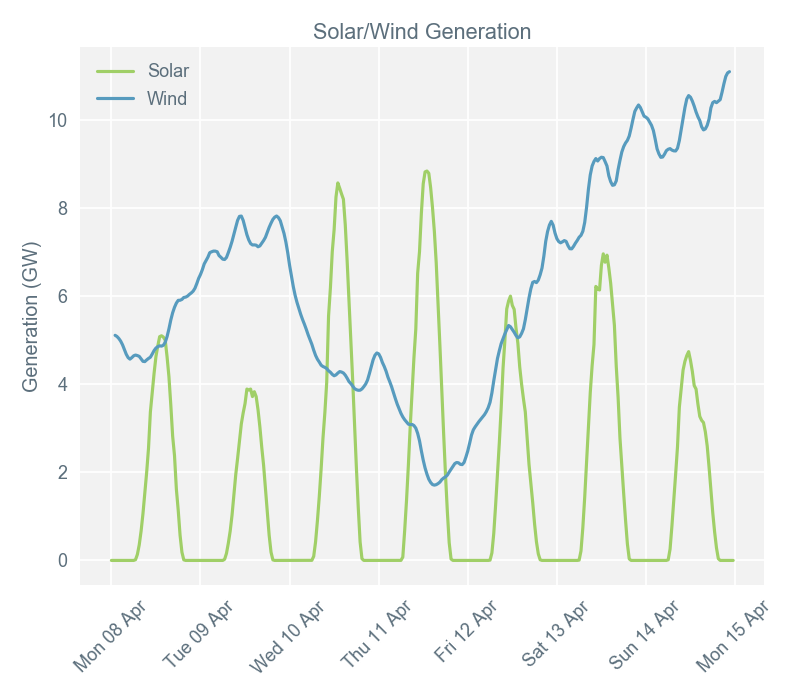 Wind output was relatively high at the beginning of the week, before dipping over Wednesday 10 and Thursday 11April. This provided a bullish driver for day-ahead prices. Towards the end of the week, wind output picked up again. At 13:00, on 13 April, wind and solar combined to make up almost 45% of power generation output. At this point in time, the carbon emissions from UK generation was 133g/kWh, compared to the average of 202g/kWh for the week. 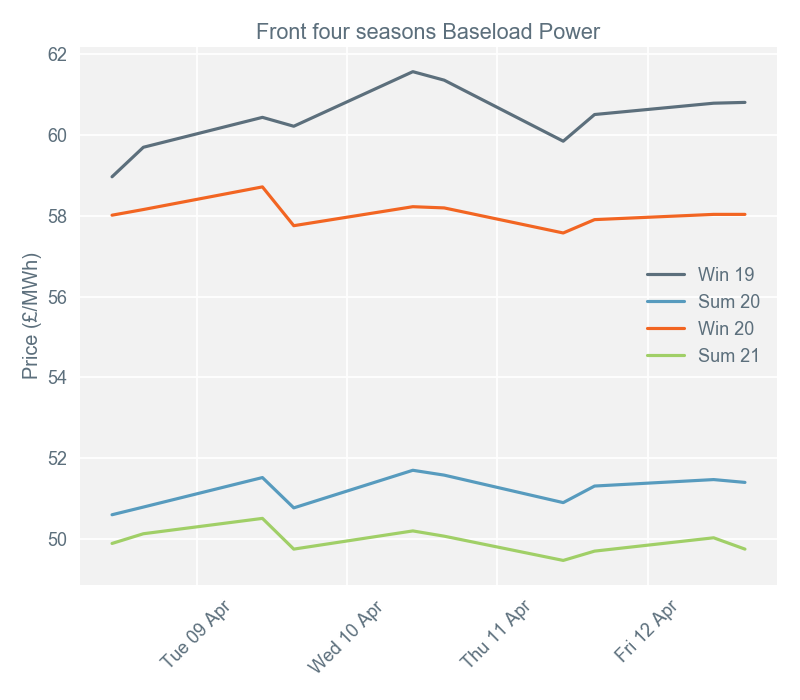 Secure and promote* (Seasons +1, +2, +3, +4) baseload contracts gained on average £0.63/MWh during week 15, although most of this increase was concentrated to the front two seasons, winter 19 and summer 20. There was another week of volatility in the UK power market, with carbon prices the primary driver. During trading on Tuesday 9 April, the National Balancing Point (NBP) gas curve firmed, coal prices surged and European carbon reached its second highest level ever. The strength of these commodities lead to the winter 19 contract gaining over £1/MWh from where it opened the day before. On Wednesday 10 April, the European carbon benchmark continued its upward trajectory, acting as further bullish stimulus for the power curve - particularly over the front 2 seasons. The marked increase in carbon prices prevented losses which otherwise would have resulted from Liquefied Natural Gas (LNG) arrivals into Britain, and weakening European coal. On Thursday 11 April, the European carbon benchmark reached a new 10 year high, trading at over €27/tCO2e. At the beginning of April this benchmark was around €21. However, the extension to the UK’s withdrawal from the EU has been a strong bullish driver for carbon, and these gains have fed through to gas and power. *For more information about Secure and Promote, please consult this Ofgem web page. The annual power graph shows how the value of an annual power contract changes over time. The annual contract value is the average of the front two seasons, currently winter 19 and summer 20. To help you make sense of the industry, you can also use our jargon buster and handy guide to Third Party Costs (currently 60% of your bill). And for interesting articles and useful insights, look out for our blog. Report written by Thomas Stebbings and Ben Symonds, Haven Power’s Portfolio Analysts. To speak to them, or the rest of our Flex & Portfolio Management team’s analysts, call 01473 707755 quoting reference HP250. Although we’ve made all reasonable effort to verify the information in this report and provide the highest possible accuracy, Haven Power Limited gives no warranty - express or implied - in respect of this information. Furthermore, our provision of this report does not constitute advice of any kind and readers should not take it as the basis for any commercial or financial decisions. You should make any such decision based on your own records, knowledge and perception of power market data, supplemented with appropriate independent expert advice when required.